!! OMG, how convenient: Energi To Go !! Full disclaimer: Energizer sent me this free thing in the mail and I said I would write about it on the blog. 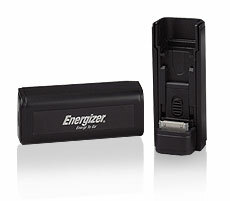 The Energi To Go iPod charger is designed to recharge your dead iPod when you don’t have access to an electrical outlet. They market it as being convenient for commuters, though your commute would have to be REALLY long for your iPod to discharge during that time. I find it most convenient if you’re on a long trans-Atlantic plane ride and you’re watching movies on your iTouch. It gives a couple full charges of the iPod off of two AA batteries, which is just perfect if you’re trying to avoid watching Air Canada’s crappy movies like Ace Ventura: Pet Detective. They also make a version for your cell phone, which I imagine more people would have use for, though I didn’t get one of those for free, so I have no idea how it works. 1 Comment on "OMG, how convenient: Energi To Go"
What a great gadget — my iPhone dies twice a day if I don’t put it on the charger while I’m at my computer. It’s really bad when I’m out of the office all day.